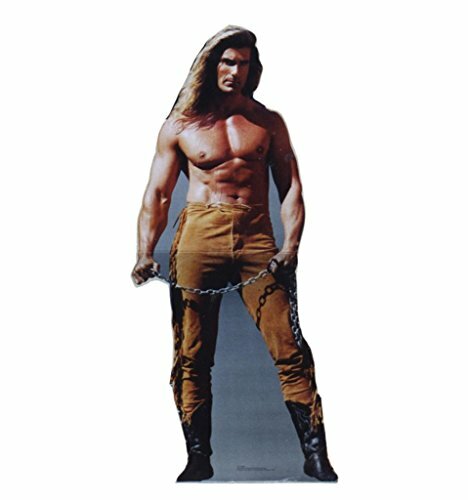 This is a life-size cardboard cutout of Fabio Lanzoni that stands at size of 76" x 34". Fabio Lanzoni is an Italian actor, fashion model, author, and spokesperson. He also appeared on the covers of many romance novels throughout the 1980s and 1990s. Fabio was in many films and television shows. In this image, Fabio is wearing brown pants, has a chain in his hands, and is shirtless. He also has really long, flowing hair. This cardboard standup of Fabio Lanzoni is very fun and exciting. Get yours today! How to Set Up Your Standup: 1. Unfold standup and easel. Lay standup face down on a clean, flat surface. 2. Fold easel up along the long vertical crease that runs the length of the standup. 3. Lift upper and lower tab to lock easel in place. 4. Attach upper tab to top of easel. About Advanced Graphics: Since 1984, Advanced Graphics has been committed to producing the highest quality Cardboard Standups and Custom Prints in the world. We are the worldwide industry leader in the licensing and distribution of Cardboard Standups. We are also the #1 source for Licensed and Custom cardboard standups in the industry. Our goal is to provide the highest quality prints to our customers. We put our customers first and will continue to provide the best customer service to those who keep us in business.